Call us to Plan Your Party Now! will want to remember for a long time! "Awesome party entertainment Sat night, well done"
Sky Bar - London Hilton,Blickling Hall, Woodall Manor, Orton Hall, The Assembly House, Marriott St Pancras Renaissance London Hotel, Voewood House, Red Arrows Aerobatic Team Hanger, and Cambridge University. where we get everyone involved, there is something to suit everyone. > Your personally chosen music tracks/eras/genres. We are open to requests on the night and will play them if possible and they're not on your 'don't play' list. If wiFi or an excellent mobile signal is available I'm able to download tracks that I don't have with me too. > Your personal digital images displayed on screen. Up to 30 images created as slide show for projection. > A selection of music videos and video backdrops. Music videos range from some old Abba and Rod Stewart tracks, through popular movie sound tracks (Grease, Dirty Dancing etc) to Blurred Lines. Where I don't have a music video available then I have a range of image videos and graphics to suit a variety of eras and music styles. > Background music during arrival/meal/buffet. 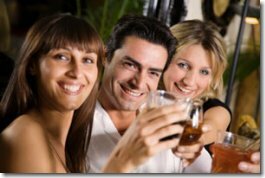 Lower volume to allow chatting slowly building up to entice them onto the floor. > Early evening 'Mini-Disco' for the little ones. Not sure if you have little ones coming, but I can do Superman, agado etc for a while to keep them occupied at the beginning. Your Party! Your Music! 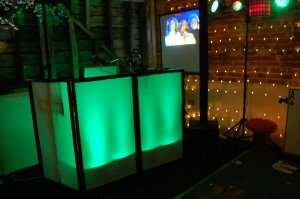 will work with you to find the best party and music options to suit your guests. We take in their age range and possible interests, then we take into consideration what you want in the way of entertainment. It might just be background music, or maybe you want everyone up on the floor laughing. 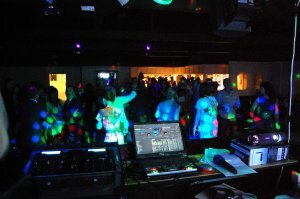 The play list for your party will be created with your input. We'll work with you to find a mix that will please as many of your guests as possible. Swing, Lindy Hop, Jitterbug, Jive, Ballroom, Latin, Salsa, Modern Jive, Disco Classics. If you want it in - IT'S IN !
" You were fabulous! Everyone has commented on the music and how much they enjoyed it, and the awards ceremony with the slide show and music to go with each person really made the occasion so much more special. Thank you so much for suggesting those ideas to me and putting it all together. We had a fantastic night, and you were a big part of it. I would be happy to recommend you to anyone else needing a DJ who goes the extra mile! " " Thank you so very much for making it such a wonderful evening. Everything was perfect from the film clips, pictures, dancing and the music throughout the evening. My mum couldn't have been happier and she asked me to pass on a massive thank you. I haven't seen her enjoy herself like that in a very long time. It was tailored perfectly to the party. " Thankyou so much for helping to make our wedding party so special and for all the hard work you put into preparation. We could not have asked for more! " "I would like to thankyou for a great night, you were fantastic. I really enjoyed all the music and had a lot of people ask how I found you because they enjoyed it. Any further music in future I will be using you again :)"
"Roy was very professional - he liaised with me before the event and was very helpful at all times. The party was for a 70th, but we wanted a lively party for all ages. It was enjoyed by all and the dancefloor was never empty. I would definitely recommend Roy." 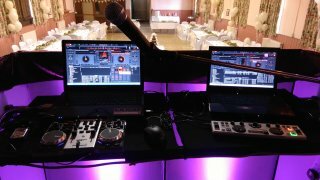 "Thank you both so much everyone had a great time great music thank you both"
" Thank you for arranging the music for our wedding reception at Orton Hall in Peterborough. All our guests and us enjoyed the choreographed dances very much. Also we appreciated the display of our childhood photos. We had a very good evening. Thank you for making our evening so special. " " Thanks to the two of you everyone has commented on what a great do it was. " 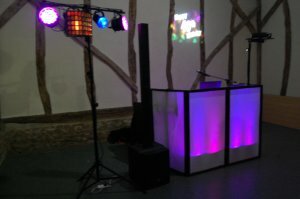 " I was impressed by the quality of their presentation and also of their choice of music as we had all age groups. They were 100% professional and I would be more than happy to use them again. WELL DONE, they are an asset to Norfolk "
"It was a great night! 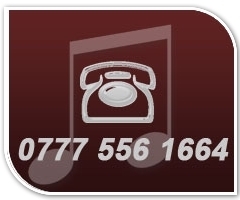 Thankyou x"
Give us a call on 0777 556 1664 or email us and we'll be back to you as soon as possible. 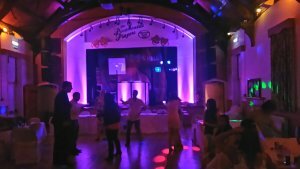 Provide entertainment for Weddings, Anniversaries, Birthdays, Christenings, Balls, Dances, Team Building Days, Staff Training Days. Covering Norfolk, Suffolk, Cambridgeshire, Essex & London. Available in all parts of the UK by Arrangement.